While the talk of the town all week long was more about the future of JTIII on the Hilltop, many people, including the Hoyas team could not forget about the task at hand, taking on the 2nd ranked Villanova coming into town, having won its last 8 games in a row. 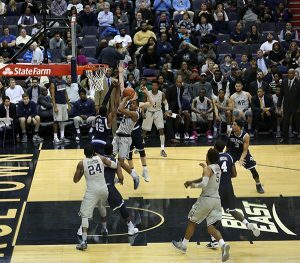 That task proved to be more than a challenge for the Hoyas and their struggling offense. The game which started out with Nova hitting a quick three pointer was a little lopsided for both teams in the first half. For the Hoyas, they just could not seem to hold on to the ball and the Cats just could not get their normal offensive prowess going. The big problem for the Hoyas was the second half, or should we say the final 10 minutes of the second half. Villanova scored on 15 of 17 possessions before taking a shot-clock violation with less than a second remaining, closing out the drubbing with a 32-12 run, which included two huge threes to the excitement of the Villanova bench. Bouncing back would have been a bit easier if the Hoyas could have found some sort of balanced offense other than Rodney Pryor. Rodney Pryor scored 21 points for the Hoyas (14-17, 5-13 Big East), who have lost five in a row and will play in the opening game of the conference tournament for the second consecutive year. So whats next for the Hoyas, who have delivered one of the worst storylines in school history this season. No NCAA Tournament, n0 NIT, no supportive fans, what does that leave for this team? This isn’t the NBA where you can say, oh well, we have a draft lottery to look forward to in the off season. This is the Georgetown Hoyas legacy we are talking about. Barring an unexpected run to a Big East tournament title, where Georgetown would have to face Villanova again in the quarterfinals if it upends St. John’s on Wednesday, the Hoyas will be left with a losing record in back-to-back seasons for the first time since 1971-73.